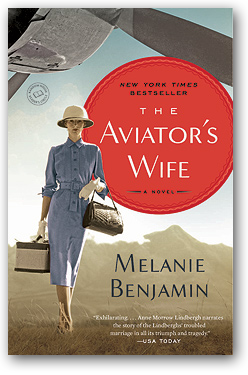 The questions and discussion topics that follow are intended to enhance your reading of Melanie Benjamin's The Aviator's Wife. The epigraph for this novel is from Antoine de Saint-Exupéry who, like Anne Morrow Lindbergh, was both a celebrated author and noted aviator. Do you agree with his statement that "One must look with the heart?" What do you think that means? And do you think it means something different to an artist (author) as opposed to a scientist (aviator)? One of the recurring themes is how Anne will choose to remember Charles. How do you think she concludes to remember him by the end? How does it change? Anne's father says, "And there's Anne. Reliable Anne. You never change, my daughter." (pg. 11). How does Anne change over the course of this novel? Or does she? Compare the celebrity of the Lindbergh's to the celebrity couples of today. What current celebrities do Charles and Anne remind you of most? How does Anne's nomadic lifestyle as the daughter of an ambassador later influence her concept of "home" with Charles? What do you think defines home? Anne seems to think of herself as an outsider—someone too shy and insular to make a big impression on someone else. Do you think Charles saw through that? Or, do you think that was something about Anne that appealed to him? Is Charles an insular character himself, whether by personality or forced into a "celebrity bubble?" Or, do you think Anne simply misevaluates herself? Have you ever met someone famous? Did they live up to your impression of them? "Had there ever been a hero like him, in all of history?" (pg. 16) Anne starts her description of Charles with hero worship, comparing him to Columbus and Marco Polo. How does her opinion evolve as she comes to know him better? How did your opinion of Charles Lindbergh evolve through Anne's story? The title of this book is, of course, The Aviator's Wife. Do you think that's how Anne views herself upon marrying Charles? Do you think she sees that as a role she's playing, or as a defining characteristic of who she is? Does it change over the course of the book? Have you ever been up in a biplane? Do you think you would ever go, even with an expert aviator at the controls? Compare the relationships Anne has to the men in her life: her brother, Dwight, her father, and Charles. What rights to privacy do you think a public figure should have? Does it go against being a public figure to get to decide what parts of his or her life stay private? Do you think Charles and Anne were in love? Why or why not? Did that change over time? Do you think you could keep the secrets that Anne keeps from her children? Why or why not? What do you think flying represents to Anne? How does it compare to her with writing? Which do you think is more important to Anne? Do you think Charles Lindbergh was a good husband in any ways? What do you think makes for a good partner? Is Anne a hero? Why or why not? If you could ask Anne a question, what would it be? How does Anne's relationship with her family change after she marries Charles? How would you react to the scrutiny by the press that Anne and Charles endured? Would you want to be famous if it meant being constantly under the microscope? Would you answer differently if there weren't social media outlets but the same type of newspapers and newsreels from Anne and Charles's lifetime?